← The Benevolent Light on StoryFinds! 5. Read about a billion books (some that I own, others I’m even procrastinating buying, because my reading list is so overwhelmingly long that I’ve apparently shut down and decided ignoring it is the best option). 6. Get the publishing company I’ve recently acquired off the ground. 7. Create a “cooking with booze” cookbook (I’ve started testing some recipes even, just haven’t written them down, taken pictures, or any of the other hundreds of necessary steps). Those are just the ones I can think of right off the top of my head. there are probably a lot more, and many that I’ve long forgotten. I often am able to channel my procrastination for one task in order to complete several others (example: I did about 6 household chores tonight before tackling writing a blog post). But now that I’m trying to run a business, I can’t afford to procrastinate the most important thing. And it’s not like I can just invent some “more important” task that I can use working on the publishing company to procrastinate. Because it’s not that easy for me to trick myself. 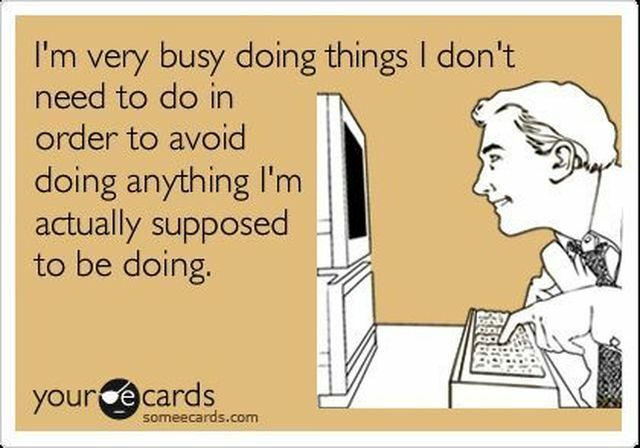 So how do you battle procrastination? I know the easiest answer is to just stop. To just get up and do whatever it is I’m avoiding. But I’m looking for strategies that don’t rely so blatantly on self control. Let me know what you think! Posted on March 28, 2014, in Writing and tagged life, Procrastination, publishing. Bookmark the permalink. 2 Comments.